Months later sculpture artists breathed a second life into something Mother Nature attempted to destroy. 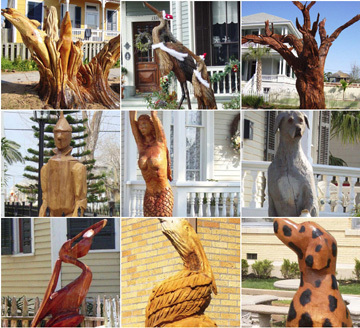 Whimsical sculptures have replaced the majestic oaks that once lined many neighborhood streets and shaded homes. Tucked into gardens and nestled inside yards the sculptures are there for the public to enjoy. This sculpture is located at 628 14th Street (behind the Mosquito Cafe) by artist Dayle Lewis. This sculpture is located at 1508 29th Street by artist Earl Jones. This sculpture is located at 511 17th Street by artist Jim Phillips. This sculpture is located at 1124 37th Street by artist Earl Jones. 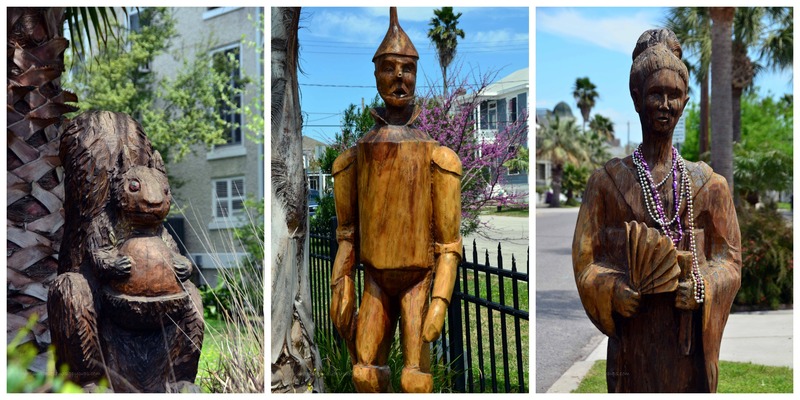 This sculpture is located at 1620 Sealy by artist Dayle Lewis. This large Live Oak contains 17 birds on the branches and relief carvings of several small plants and animals around the trunk. This sculpture is located at 20 South Shore Drive by artist Jim Phillips. 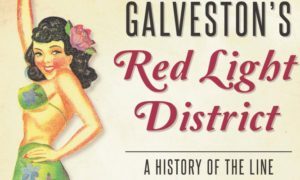 This sculpture is located at 823 25th Street (on the grounds of Galveston City Hall near Fire Station 1) by artist Jim Phillips. This sculpture is located at 828 Ball (facing 9th Street). The artist is unknown. This sculpture is located at 1302 Ball by artist Dayle Lewis. This sculpture is located at 5701 S 1/2 (facing 57th Street) by artist Jim Phillips. This sculpture is located at 1717 Ball by artist Jim Phillips. This sculpture is located at 1228 Sealy (facing 13th Street) by artist Dayle Lewis. The homeowners own a beautiful, gentle, grey Great Dane, named Hunter. The tree had actually grown around the fence at the spot where the paws grip the fence. This sculpture sustained the only vandalism that we are aware of. Just after it was finished, someone stole one of the paws. The homeowner offered a reward…$50 for the return of the paw; $500 for the hands of the thief! The sculptor, who was still on the Island, carved and installed a new paw. This sculpture is located at 1415 Ball. This sculpture is located at 718 41st Street (on grounds of Wright-Cuney Park) by artist Earl Jones. This sculpture is located at 4910 Avenue P 1/2 by artist Earl Jones. 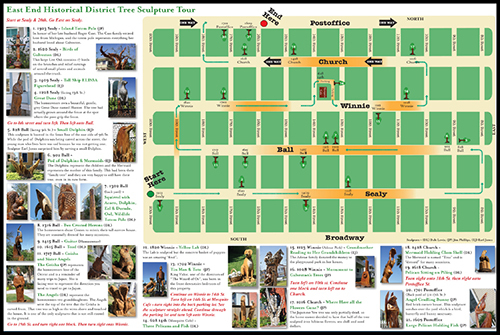 This sculpture is located at 1609 Postoffice Street by artist Jim Phillips. This sculpture is located at 4017 Avenue M 1/2 by artist Dayle Lewis. This sculpture is located at 1428 Church by artist Dayle Lewis. This sculpture is located at 1028 Winnie by artist Jim Phillips. 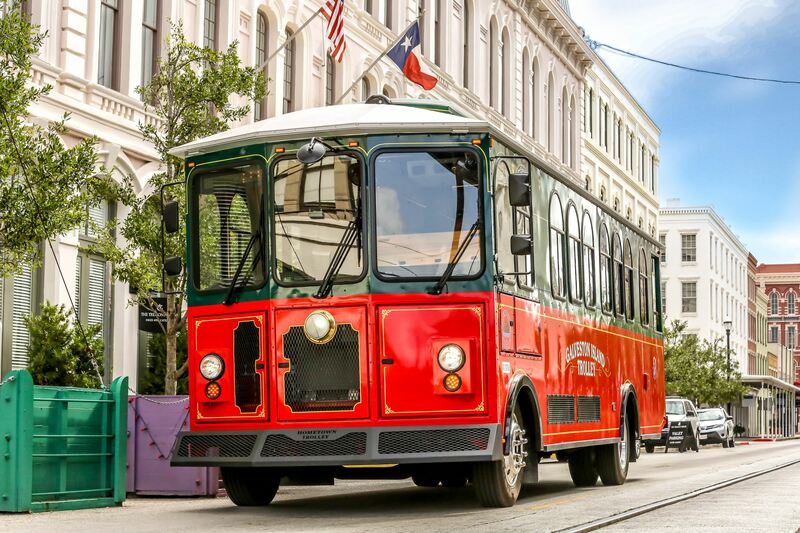 Located at 1302 Ball by artist Dayle Lewis. This sculpture is located at 1618 Church by artist Dayle Lewis. Located at 902 Ball by artist Earl Jones, the dolphins represent the children and the Mermaid represents the mother of this family. This had been their “family tree” and they are very happy to still have their tree, even in its new form. This sculpture is located at 12330 Jenkins, by artist Earl Jones. Located at 1717 Ball by artist Dayle Lewis. Located at 1508 29th Street by artist Earl Jones. This sculpture is located at 4510 Avenue L by artist Earl Jones. This sculpture is located at 1702 Winnie by artist Jim Phillips. This sculpture is located at 1615 Ball by artist Dayle Lewis. This sculpture is located at 1316 Ball by artist Dayle Lewis. This sculpture is located at 1823 Ave. L and was created by Jim Phillips. This sculpture is located at 83rd Street at the Airport (inside the castle playground at Schrieber Park) by artist Dayle Lewis. This sculpture is located at 1820 Winnie by artist Dayle Lewis.